At around 11:57 am EST (that’s 8:57 am for us West Coast folk) on Wednesday, NASA’s Discovery Space Shuttle will land at NASA’s Kennedy Space Center in Florida to wrap up its final mission, barring poor weather or changes of plans. Here are some of the tech maneuvers that the space station has been handling in the 11 days since its launch, according to NASA's update feed. • At launch, it was two days from Florida to the International Space Station (like from LA to Chicago, but with fewer pit stops and a little more leg room). 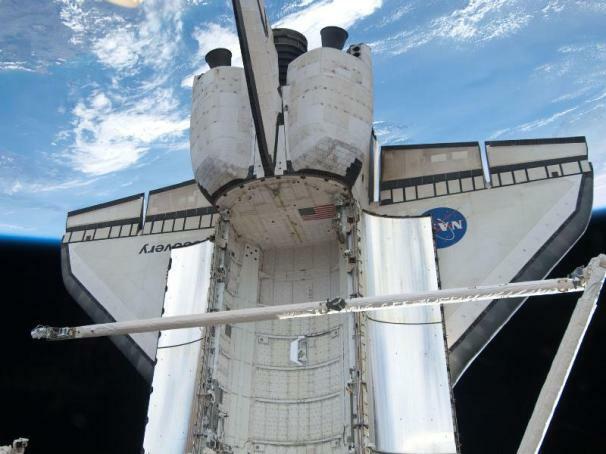 Once out in orbit, Discovery performed a standard scan of the shuttle’s external thermal protection system by using its robotic arm to scan for cracks and possible damage. The crew then installed a centerline camera to help the shuttle align during the ISS rendezvous. • As Discovery approached the ISS, its crew fired the jets in short spurts to fine-tune alignment with the outer-orbit outpost. 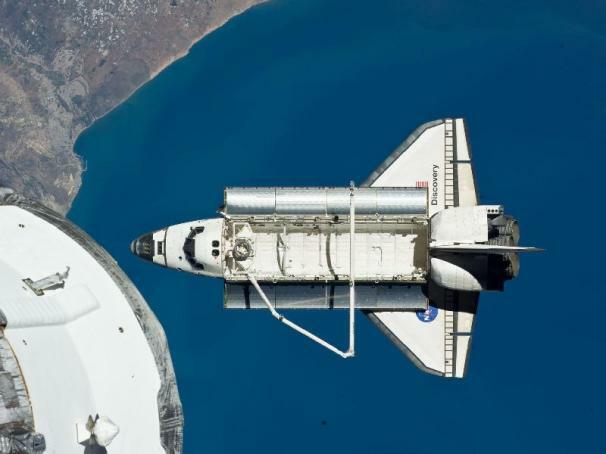 The crew stopped the shuttle 600 feet directly below the ISS, and then did a one-degree-per-second backflip so that crew members on the ISS could snap photos of the shuttle’s thermal protection layer on it’s underbelly. These photos were then relayed back to earth for science and safety analysis. • When the backflip maneuver was complete, the captains and crew flew Discovery to a position 310 feet in front of the ISS and slowly (relatively) backed her up into a “pressurized mating adapter” on the space station. To us earthlings, the two orbiters were moving at 17,240 miles per hour over Australia when they docked. • The crews of both orbiters opened the hatches once dock was complete and then operated robotic arms to take the "Express Logistics Carrier 4"--a sort of space tool shed- out of Discovery’s cargo bay and affix it to the outside of the ISS where it’ll be used for the storage of spare parts. Discovery also attached a Permanent Multipurpose Module to the earth-facing side of the ISS, where it will be a sort of walk in closet to the ISS with a robonaut living in it. How quaint! • Two spacewalks were planned for this Discovery trip. The night before both, the two spacewalkers camped out in Discovery’s "Quest airlock" because the lowered atmospheric pressure in the chamber would help draw pure nitrogen out of their blood and prevent decompression sickness (nicknamed “the bends” for the severe joint pain it can cause) upon exit of the shuttle. During the walks, the crew rearranged a broken pump module, adjusted video cameras and lenses, and installed a power cable on the outside of the ISS, among other maintenance tasks. • The day the hatches were closed on the ISS and Discovery, William Shatner delivered a special message about science. William Shatner! Then, Discovery fired its jets and detached from the ISS… forever. • In preparation for Wednesday, the reaction control jets were each fired twice, and auxiliary power units and speed brake were tested out to make sure that reentry would be smooth and successful. Here’s to the safe return of our space adventurers! Live coverage of the landing will be available on NASA’s website starting at 8:30am EST on Wednesday morning. Megan Geuss is a freelance writer in the San Francisco Bay Area and masquerades as @ MeganGeuss on Twitter.